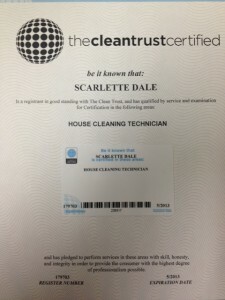 Bit a Bliss now has one of the very few “Certified House Cleaning Technicians” serving Dallas, Plano, Frisco and surrounding areas. Back in February, I spent two days at a certification class taught by the Institute for Service Excellence, took the test and passed with flying colors! The class was amazing and I learned so much! I am now able to pass on this knowledge to all of our staff. I also intend to have them certified the next time there is a class in the Dallas area. For many the largest investment they will ever make is in their home. You don’t want just anyone caring for that investment. It is very important that your house cleaner understands the products they are using and the surfaces they are cleaning.